Vintage Charles Russel framed print, as it arrived from the estate. Print in original white and gold frame. Probably from the 40's or 50's,I'm guessing. 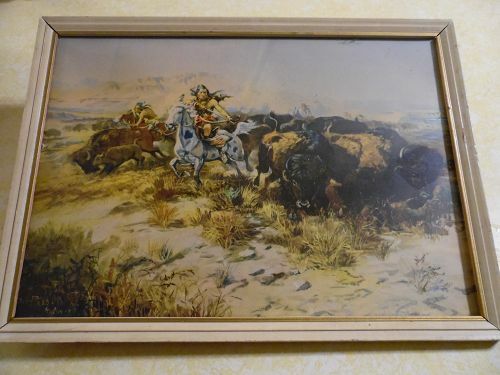 Russel did a lot of different Buffalo hunt scenes, as it seemed to be one of his well liked subjects to paint.This one called "The Buffalo Hunt (Wild Meat for Wild Men)" by Charles Russell measures 15 1/8" x 11" over all.